I do most of my "serious business" in my bullet journal, but I'm also a big believer in having a pocket memo book on hand at all times. Like many, I generally go with Field Notes as my daily carry notebook of choice. Part of the Field Notes experience is appreciating the wear and tear that develops over time as the book rides along in your pocket on a daily basis. However, there are a good many people out there who prefer the added protection of a cover. I fall somewhere in the middle. I can appreciate a bit of wear, but I prefer to fill up my book before it turns into a mangled mold of my derrière's lovely curves. 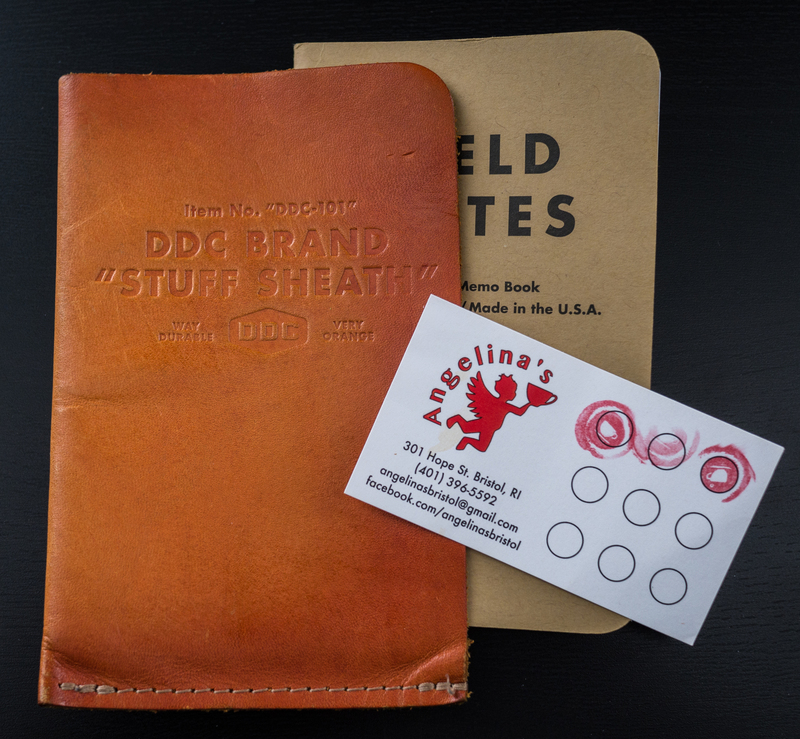 The DDC Brand "Stuff Sheath" from Draplin Design Co. (DDC) hits the mark extremely well for me. 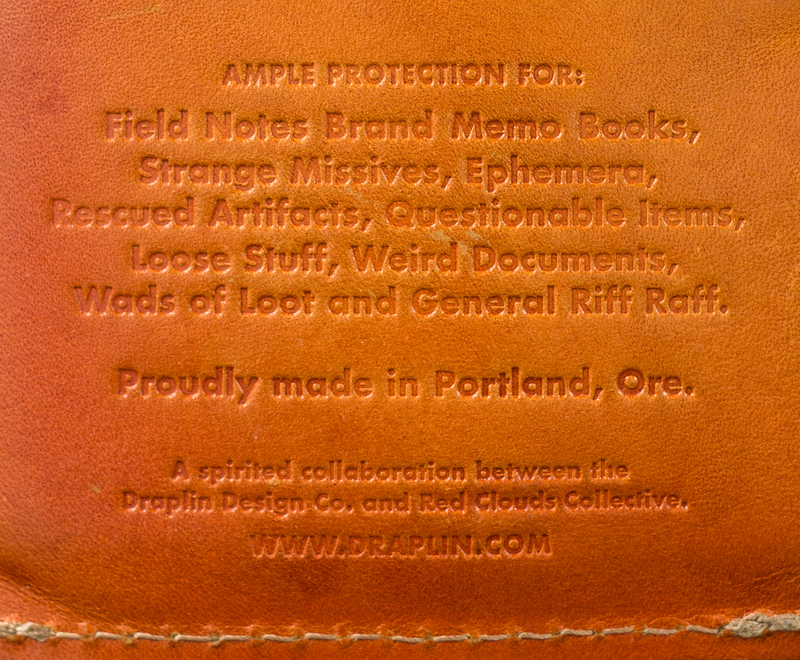 Aaron Draplin, if you're not familiar, is original designer behind Field Notes. The Stuff Sheath is a simpler take on the leather memo book covers that are available in the official Field Notes store and from other sellers. The sheath, which is manufactured by Portland-based Red Clouds Collective, is essentially a bright orange leather fold that is stitched along the bottom. The top and right edges are left open for easy access to your memo book and other assorted items that you insert during your travels. Given its shared lineage with Field Notes, one or two books slide into the sheath perfectly. It also shares the same Futura-infused goodness as its paper-based cousin. The back even includes a quirky collection of suggested uses that is reminiscent of the Field Notes "Practical Applications" list. I've been using my Stuff Sheath daily for about 6 months, and it has held up extremely well. I also very much prefer it to a more traditional leather cover. I love the fact that it provides a measure of protection while still allowing me to work with a "naked" Field Notes book when I'm ready to write. I also find it handy for keeping temporary items like boarding passes, hotel keys, and business expense receipts organized while I'm on the road. Only orange lovers need apply, which is fine by me, but it's worth noting that the brightness of mine has mellowed out a bit with wear. Like most things in the paper and pen world, it really comes down to personal preference. However, the Stuff Sheath serves my needs perfectly.